Containing a wealth of information it answers the questions before you can ask them. The booklet will give you invaluable advice and guidelines, offering a great insight into hosting, the pit falls and the many benefits but overall its aimed at helping you make your hosting experience a success with memories to cherish. Our on-line application process is designed to be easy, simple & detailed. At Leir we devote ourselves to matching both students & families so this application is a vital part helping us create the best mutual experience for all, the form takes about ten minutes to complete but can be the first step in a very worthwhile journey. 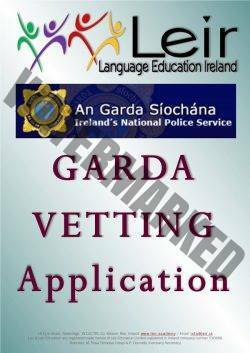 Garda vetting is something we have all become aware of, especially if you’re involved in coaching or activities with children. The process is very simple, just download the application, complete it in full and we’ll collect and process it to An Garda Siochána. This is a compulsory condition of hosting a Leir student. So what's involved and what kind of programs do students attend? 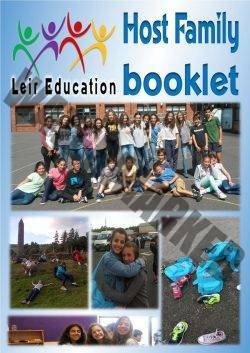 Hosting a student with Leir is not difficult, however like most things concerning children or minors there is a criteria. What’s involved once your guest has arrived couldn’t be easier…. Simply, treat him or her as you would treat and care for your own children. 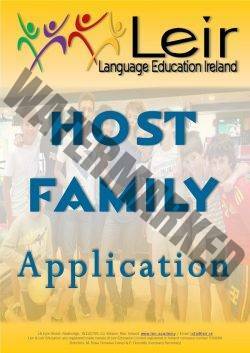 Your guest has chosen to stay with an Irish family in a natural family environment to gain full benefit of the experience, to take part in a normal daily routine. The majority want to spend lots of time with their Irish family, especially your children. Depending on the programme you guest has chosen will of course involve a level of commitment from you and your family. For the purpose of this example we have outlined some particulars which might be of interest. Program duration can be two or three weeks. Your guest normally would be part of a school group and we would always try to have them in the same locality e.g. same estate or within walking distance to each other. He or she will be attending our English classes, in either our Language Academy or our summer school depending on program. Give your guest a packed lunch for school and trips. You would normally be required to bring your student to and from our prearranged meeting points for excursions or trips. Again car-pooling is always a great idea. Programme duration is normally three or four weeks. Your guest will be an individual or maybe travelling with other friends from the same area or town. You would normally be required to bring your guest to and from summer camp. Again car-pooling is always a good idea. Give your guest a packed lunch for camp and trips. Your guest will be an individual and may have friends here from the same area or town. Give your guest a packed lunch etc. You’re guest may or may not be attending our extra classes.